[S1676] Find A Grave, online http://findagrave.com, Elizabeth Reiss Kummer, record added July 26, 2009, Memorial #39919563, accessed November 5, 2013. [S1676] Find A Grave, online http://findagrave.com, Milton Frederick Kummer, record added July 26, 2009, Memorial #39919694, accessed November 5, 2013. [S1014] Certificate, Kwiatkowski, Edna baptismal certificate, September 2, 1917, Annunciation Church. [S1015] Certificate, Alexander Kwiatkowski to Rose Olszewska marriage of March 25, 1912. [S1016] Alexander Kwiatkowski, Illinois Certificate of Death, FHL #1852688. [S1066] Alex Kwiatkowski, Illinois Return of Birth no. 8480 (September 26, 1893). [S1015] Certificate, Alexander Kwiatkowski to Rose Olszewska marriage of March 25, 1912, FHL #1030518. [S1016] Alexander Kwiatkowski, Illinois Certificate of Death. Mr. and Mrs. William Batke, formerly of this city, announce the birth of a five and one-half pound baby girl, Cynthia Renee at the Cuneo hospital in Chicago. Both mother and daughter are doing well. William is the son of Mrs. Henry Batke, 714 Vine st.
Edna Batke, 77; of Palatine, died Tuesday, July 4. Arrangements by Middleton Mortuary Service, (708) 577-7797. [S1004] 1920 US Census, Illinois, Cook County, Chicago, Washington, DC, ED 884, Page 13B, Ancestry.com, accessed November 17, 2006. [S1017] Edna R. Batke, Illinois Medical Certificate of Death. [S1002] U. S. Social Security Administration, Edna R. Batke, SS# 351-10-6593, accessed November 15, 2006. [S1003] Cara McIntyre Batke, "Genealogy questions," e-mail to Elaine McIntyre Beaudoin, November 22, 2006. [S1012] Cynthia Gibson, Illinois Medical Certificate of Death. [S1127] The News-Palladium, December 21, 1962, page 3, Ancestry.com, accessed February 3, 2010. [S1022] 1920 US Census, Illinois, Cook County, Chicago, Washington, DC, ED 1629, Page 10B, Ward 27, Ancestry.com, accessed November 11, 2006. [S1027] Sophie Rohloff, Illinois Certificate of Death, FHL # 1953744. [S1029] Bernhardt Rohloff, Illinois Certificate and Record of Death, FHL #1239987. [S1031] Chicago Daily News, October 8, 1926, page 7. [S1036] William H. Rohloff, Illinois Medical Certificate of Death. [S1037] William Herman Martin Rohloff, Illinois Certificate of Birth no. D.S. 106266 (January 8, 1942). [S1224] Rohloff-Wessolick Marriage License: Family Search, accessed September 11, 2010, Collection: Michigan Marriages, 1868-1925. [S1023] 1930 US Census, Illinois, Cook County, Chicago, Washington, DC, ED 1170, Page 11A, Ward 27, Ancestry.com, accessed November 18, 2006. [S1030] 1900 US Census, Illinois, Cook County, Chicago, Washington, DC, ED 822, Page 2A, Ward 27, Ancestry.com, accessed November 18, 2006. [S1028] Certificate, William Rohloff and Sophia Kunn marriage of August 13, 1887, FHL # 1030165. [S1692] George Freyer, Illinois birth certificate no. 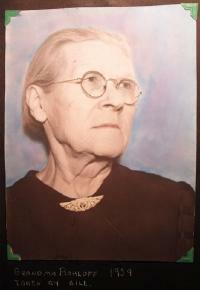 14556, familysearch.org, accessed January 17, 2013 (24 April 1922). [S1007] 1930 US Census, Illinois, Cook County, Maine, Washington, DC, ED 2200, Page 10B, Ancestry.com, accessed November 18, 2006. [S1268] William Rolof, Illinois birth certificate no. 14027, FamilySearch.org, accessed October 18, 2010 (September 30, 1893). [S1272] Alma I. Frank, Illinois Medical Certificate of Death. [S1021] 1930 US Census, Illinois, Cook County, Chicago, Washington, DC, ED 1445, Page 2A, Ward 40, Ancestry.com, accessed November 18, 2006. [S1032] Chicago Daily News, May 5, 1942, Page 25. Marriage*: He married Dorothy Connor. [S710] Chicago Daily News, September 6, 1946, Page 24. [S2092] Chicago Tribune, June 3, 1926, Viewed on Ancestry.com entry by Westtrack on Westbranch Family Tree. Accessed May 9, 2015. [S1676] Find A Grave, online http://findagrave.com, Bernard Francis Laney, record added June 23, 2010, Memorial #54051984, accessed November 5, 2013. [S1676] Find A Grave, online http://findagrave.com, Mary Cecilia Reiss Laney, record added July 23, 2009, Memorial #54052022, accessed November 5, 2013. [S1857] Sheboygan Press, April 2, 1964. Biography*: Miss Maureen C. Laney, 19, a member of a prominent Sheboygan family, was one of four college students killed early Wednesday in a truck-car collision near Culbertson, Neb. [S1676] Find A Grave, online http://findagrave.com, Maureen Cecilia Laney, record added March 12, 2010, Memorial #49608359, accessed November 5, 2013. [S1677] Wisconsin, Death Index, 1959-1997, online www.ancestry.com, Maureen C. Laney entry, certificate #016945, Ancestry.com, accessed November 5, 2013. [S1546] Chicago Tribune, September 14, 1965, page A12. [S2114] Edward Kean Cemetery Record, Calvary Cemetery, Evanston, Cook County, Illinois, USA.